GENEVA, Switzerland, July 26, 2017 (ENS) – Wildfires in southeastern France forced the evacuation of 10,000 people overnight, French officials have confirmed. Overall, more than 4,000 firefighters and troops supported by water bombers have been trying to extinguish the flames since Monday. Hundreds of firefighters have been deployed to battle the fires near Bormes-les-Mimosas, in the country’s Provence-Alpes-Côte d’Azur region. Roughly 4,000 hectares of land have burned along the Mediterranean coast, in the mountainous interior and on the island of Corsica. 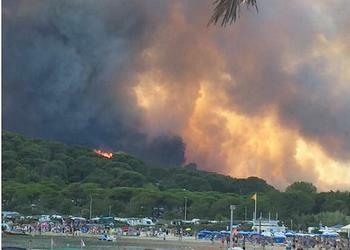 One of the worst fires is consuming forests in an area near the popular resort of Saint-Tropez. In Corsica, hundreds of homes have been evacuated. On Tuesday, before the evacuation, France had asked its EU neighbours for more help to fight the fires, activating the EU’s Civil Protection Mechanism. Twelve firefighters have been injured and 15 police officers have been affected by smoke inhalation, officials say. During June and July, climatic conditions around the world have been extreme, with fires, floods and drought making life difficult for people and wildlife in many countries. In the United States, the state of Montana is ablaze. Montana Governor Steve Bullock signed an executive order Sunday declaring a fire emergency in the state. The largest area burning in the state is the Lodgepole Complex – three fires that have burned 226,000 acres (91,460 hectares) and destroyed about a dozen homes in northeastern Montana. The fire has consumed ranch land and hay supplies. In fact, fires have been devouring forests across the western United States. The Snowstorm Fire in Nevada began on July 13. It has burned 60,000 acres (24,280 hectares) and is just 13 percent contained. The Detwiler Fire in California began on July 15. It now covers 79,400 acres 32,132 hectares) and is 65 percent contained. The heat is making travel by air in the United States difficult and, in some cases, impossible. In Arizona, from June 17-27, Phoenix International Airport had 11 straight days with temperatures of at least 110°F (43°C), with one day hitting 48.3°C (119°F). The heat caused multiple canceled flights. The hotter the air, the less dense it is, which means less lift for airplanes as they take off. In order to take off, the planes would have needed a longer runway, which is not available in Phoenix. In fact, the entire world is heating up. June 2017 extended the spell of “exceptional global warmth” that has lasted since mid-2015, according to the World Meteorological Organization, which compiles data from its 191 member states and territories. Average surface air temperatures this June were the second hottest on record, after June 2016, finds the latest analysis from the European Union’s Copernicus Climate Change Service. In addition to high temperatures, extreme weather affected many parts of the world in June and July. Rescue services and troops in New Zealand’s South Island worked around the clock over the weekend to help those affected by a severe storm that released floods and forced the evacuation of hundreds of homes. A state of emergency was declared in the South Island cities of Christchurch, Otago, Timaru and Dunedin after some areas were hit with more than 200 millimetres (7.8 inches) of rain in 24 hours. The New Zealand Meteorological Service says all of July has been marked by severe weather events, caused by low pressure systems from the Tasman Sea. But in neighboring Australia, it was the second driest June on record, with rainfall 62 percent below average for the continent as a whole, according to the Australian Bureau of Meteorology. In Indonesia, drought is drying the crops as they stand in the fields. Yet, across southern Asia heavy rains have been making life miserable for residents. This week in Bangladesh, rain has flooded the capital, Dhaka. On July 5, nearly 900,000 Bangladesh residents were affected by floods. Tuesday, in India’s western states of Gujarat and Rajasthan, four people lost their lives and 25,000 have been evacuated due to heavy rains and floods, 33 percent heavier overall than last year, officials said. Chinese weather authorities report torrential rainfall in the annual monsoon season across China for extended periods in June and early July, causing economic losses and transport disruption. Heavy rains caused cancellation of more than 600 flights at Beijing airport alone on July 6. The rainfall was one of the contributing factors to a deadly landslide with many casualties on June 24 in Maoxian County, Sichuan. Since June 22, floodwaters have inundated cities in Hunan Province, forcing more than 311,000 people to evacuate, damaging crops and destroying more than 6,300 houses, according to the China Meteorological Administration. In southern Japan, tropical storm Nanmadol on July 6 caused local governments to issue evacuation orders to nearly 60,000 residents, according to the Japan Meteorological Agency. Much of South America and Africa have been warmer than average during this two month period, according to the Copernicus Climate Change Service. The World Meteorological Organization reports the Middle East is broiling. The Iranian city of Ahwaz recorded a temperature of 53.7°Celsius (128.66° Fahrenheit) on June 29 as part of a heatwave with temperatures in excess of 50°C across the region, including Iraq and Kuwait. An even higher temperature of about 54°C (129.2°F) scorched the city of Turbat, southwestern Pakistan, in late May. But this week in Turkey, it’s too much water, not too much heat. Istanbul traffic came to a standstill as severe storms inundated the city, flooding the streets. Temperatures were much above average, and high in absolute terms, over Morocco and northern Algeria in June and July. Forest fires are burning across northern Algeria, consuming an estimated 1,000 hectares. Southern and central Europe was very much warmer than the 1981-2010 average in June, especially over the Iberian Peninsula, where Portugal experienced devastating wildfires. Conversely, says the WMO, temperatures have been well below average over the northeast of Europe. The contrast between southwest and northeast continues a pattern that was present in April and May. In Russia, June 2017 is called Junabre, meaning June plus November, because of the cold weather in the European parts of the country. June was the coldest month in the past 14 years for Moscow. The UK should be bracing for record rainfall, says Bob Ward, policy and communications director at the Grantham Research Institute on Climate Change and the Environment at the London School of Economics and Political Science. The UK’s two wettest winters on record occurred in 2013-14 and 2015-16, flooding many parts of the country. As a result, the National Flood Resilience Review was begun, but it needs expansion to include surface water flooding, says Ward.